The US Department of Defense has published a new report warning over the growing risks to its critical infrastructure and operational effectiveness from the impacts of climate change. 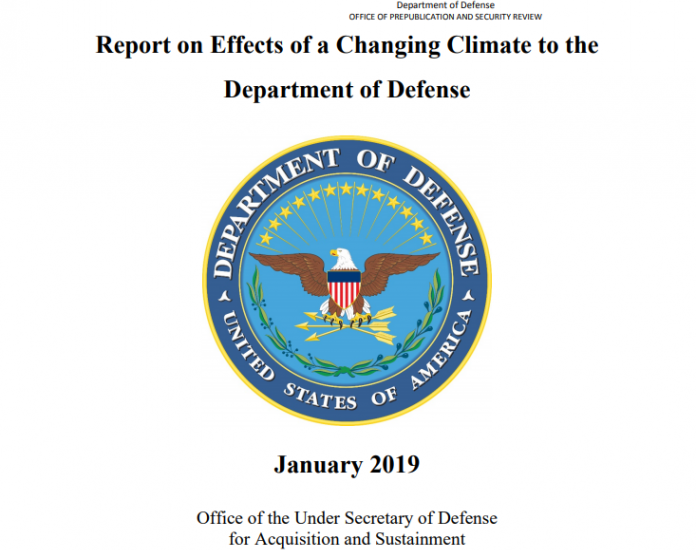 The Report on Effects of a Changing Climate to the Department of Defense provides an assessment of the significant vulnerabilities from climate-related events in order to identify high risks to mission effectiveness on installations and to operations. According to the study, the effects of climate change are a national security issue with potential impacts to Department of Defense (DoD or the Department) missions, operational plans and installations. The DoD has focused on 79 mission assurance priority installations based on their operational role. About two-thirds of the 79 installations are vulnerable to current or future recurrent flooding, more than one-half are vulnerable to current or future drought and about half are vulnerable to wildfires. The report says the Department considers climate change resilience in the installation planning and basing processes to include impacts on built and natural infrastructure, including in the event of loss or damage to critical energy and water. To better adapt to climate impacts, the DoD is also updating various built and natural infrastructure design standards. In April 2016 its Coastal Assessment Regional Scenario Working Group published a report that provided a database with regionalized sea level scenarios for 1,774 DoD sites worldwide for three future time horizons – 2035, 2065, and 2100.